A guinea hen disaster! Anyone who thinks we should all get along like animals do in nature, just don’t understand nature, but I’ll get back to that later. First I want to tell you about guinea fowl. Some people have never heard of them, some people love them and and lots of people hate them. Even so they are becoming quite popular birds to keep, because most of the country is seeing an increase in tick borne diseases and guineas love to eat ticks. That’s the top reason for keeping guineas on a pretty short list. They also lay small hard shelled eggs that are very tasty. The reasons not to keep them is a much longer list. They are extremely noisy, seriously noisy, maybe only topped by the lack of intelligence. They sound their alarm, or should I say alarming calls at anything they deem a danger.Some say they make good watch dogs, but that is only if you don’t mind them crying wolf all the time. They can be bullies; they may chase cats and dogs and have been known to kill snakes, rats and roosters. They love to roam and your neighbors may not like it ( see reason one). Guineas are native to Africa and are hardly domesticated. Without proper training they will not roost in the safety of the coop at night, they will fly to the tops of trees. They prefer to make their nests hidden in the brush, with many hens laying their eggs all in the same nest, then one will get the urge to sit on the nest when there is usually about 20 to 40 eggs in it. When I got 10 keets ( that’s what baby guineas are called) I tried to handle them to tame them but they made it very clear they did not like being handled and it caused them so much stress. When they were old enough I moved their cage in with the chickens and I think that helped to tame them. I was able to train them to come in at night by treating them with millet seeds. But I then I noticed they were not laying eggs in the coop anymore. I had found my white hen on a nest of 26 eggs and she didn’t put up much of a fuss for me to take the eggs and get her back in the coop. Then one evening only 5 guineas came home when I called them. I had an idea where they might be and when I looked I found two hens on a nest and 3 males guarding them. This time these two hens were pretty serious ( and scary) about staying put on their eggs. I had no idea what I should do. Would they be safe because they had all these males that wanted to guard them? I thought about trying to move their nest to a safe spot. I called a friend who thought I should either take the eggs and get the birds back in the coop or just leave them and hope for the best. So I left them there, half my guinea flock! Later that evening I saw the males had all come back to the coop, so I let them in. The next morning I saw one hen at the coop door. Here is where we get back to the nature part. 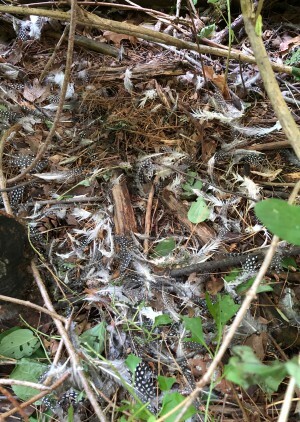 I went to check on the nest and the hen was dead with feathers scattered everywhere. imagine it was a raccoon that mangled her and left her dead next to her nest. She had been sitting on 40 eggs. Whatever it was it seems like it was just for fun as she was not eaten. That’s just one example of how creatures get a long in nature. I’m still letting my guineas free range to eat the ticks, but I won’t be letting set on nests in the wild anymore. Posted by Maryclaire Mayes on Saturday, June 30th, 2018 at 06:24 and is filed under General. New friends receive a special offer! Alabu Sampler for under 18.00. Regular price is over 36.00. © 2019. Musings From The Farm. Powered by WordPress. Cleanr theme by WPShoppe.The Legal Stuff.